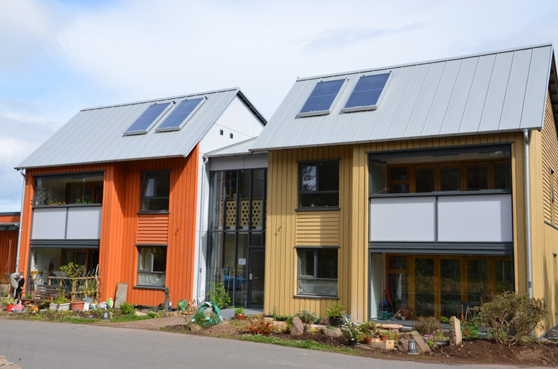 Over the last 40 years more than 100 individual homes have been built by the Findhorn Foundation as a new eco-village on site close to Forres in the North West of Scotland. In 2014 a community-owned development business, Duneland, completed the first phase of a major extension to the village, which provided 25 homes in a cohousing development. The second phase will provide six serviced building plots and a terrace of six low-cost ‘self finish’ homes. A third phase will provide eight low cost apartments. 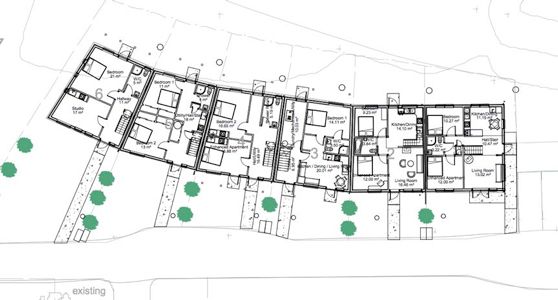 There are 25 homes in the cohousing element, arranged in three short terraces, with communal gardens between. 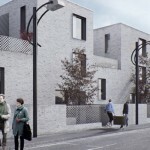 Ten of the homes are two bed houses (90 sq m), three are three bed houses (105 sq m), six are two bed flats adapted for elderly living and there are six other two bed apartments (all 70 sq m). 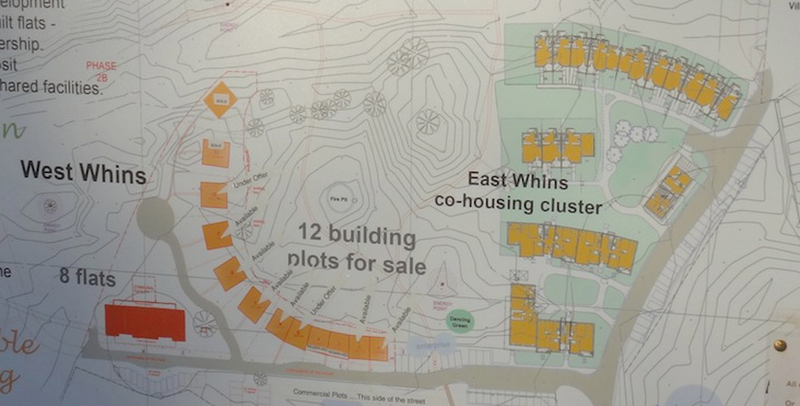 Layout of the 25-home cohousing development, showing the 31 parking spaces In addition five ‘flexi spaces’ were provided (each of 25 sq m). These were envisaged as multi-purposes spaces that could be used as additional studio or home/work facilities, an office or a store. In reality these didn’t work and four of them have been incorporated into the houses to create an additional bedroom for the residents. There is also a 85 sq m common room and a communal laundry, workshop and bike store. Typical three bedroom house layout Typical two bedroom house layout Typical two bedroom apartment layout Thirty-one car parking spaces were provided – most of them set away from the houses (see the site plan). 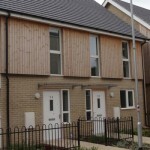 The homes employ a timber frame construction using locally sourced timber. They are well insulated and are claimed to be close to Passive standard. 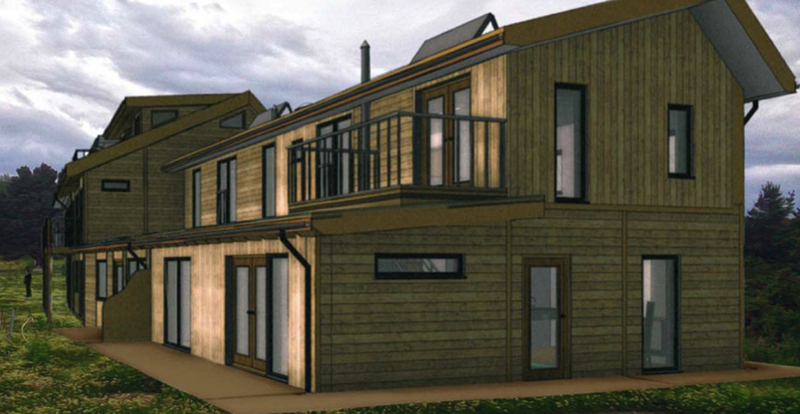 In the early stages of design the homes were planned using the ModCel straw bale system. 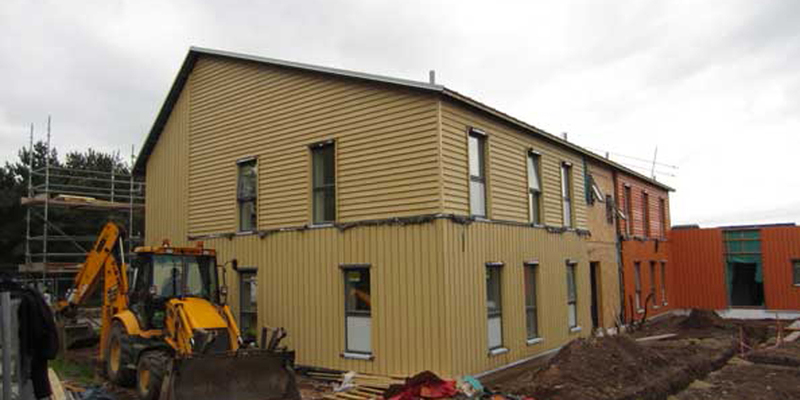 This proved to be too expensive, so a well insulated timber framed construction method was adopted instead. 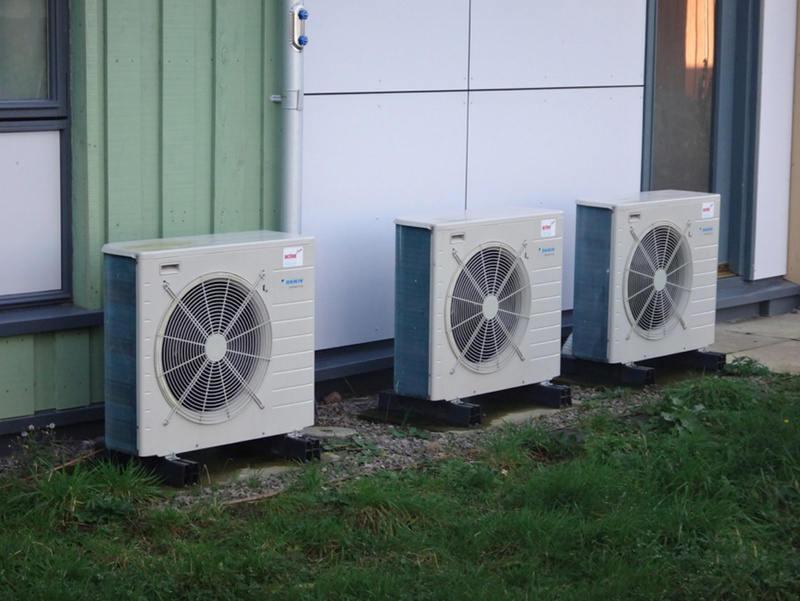 Originally it was hoped to employ a district heating CHP system to serve all the homes, but this also proved to be too costly; instead air source heat pumps have been individually supplied, along with a MVHR system. There have been operational issues with both systems. 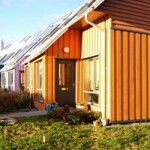 The asymmetric roof layout gives a contemporary look to the homes, and the use of colourful timber staining looks good. A shared stairway/hall is used to provide access to the apartments. Sun spaces/gallery conservatories are also provided, though some of the residents haven’t used these as planned. The project had a long gestation period, with people from the community initially meeting to discuss how land to the North of the existing village could be acquired and used back in 1996. In 1997 Duneland (a social enterprise company with 69 shareholders from the existing village or nearby) bought 360 acres of land next to the original eco- village. Around 175 acres has been preserved as natural parkland (and opened up for public access), and 30 acres is now a managed woodland. Sixteen acres has been set aside for development – this portion of the site was effectively brownfield land, peppered with concrete pads and various industrial structures from when it was previously used by the RAF. The project covers about half of this area. After much discussion among the shareholders plans were drawn up and in 2008 outline planning permission was granted for 40 homes on this section of the land. 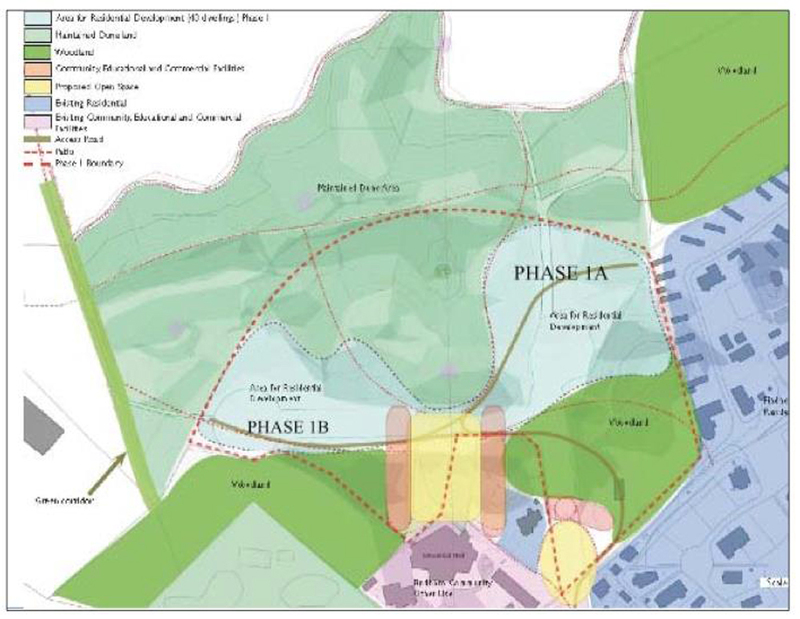 Detailed plans were then prepared in 2009 and full planning approved was achieved in May 2011. Construction began in 2012 and the first homes were occupied in March 2014. The 360 acres were acquired by Duneland from the Wilkie family. As it was largely a dune land area, covered in gorse, the cost per acre was very low. The sensitive ecology of the land has been a key factor in the way it has been managed and is why only a relatively small area has been set aside for housing development. The local authority was receptive to the proposals, though it took a full 18 months to approve the plans. The site sat within the existing settlement boundary, and the council recognised the positive impact the development would have on the area. 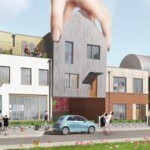 The council wanted some affordable housing as part of the development – something the team from Duneland was happy to provide, as it knew there was demand for homes to rent among the wider eco-community. In the end two homes for rent, and two shared equity properties were provided. The council worked with the Foundation to develop an allocations policy, and the rents are set using on the council’s normal social housing rent formula. 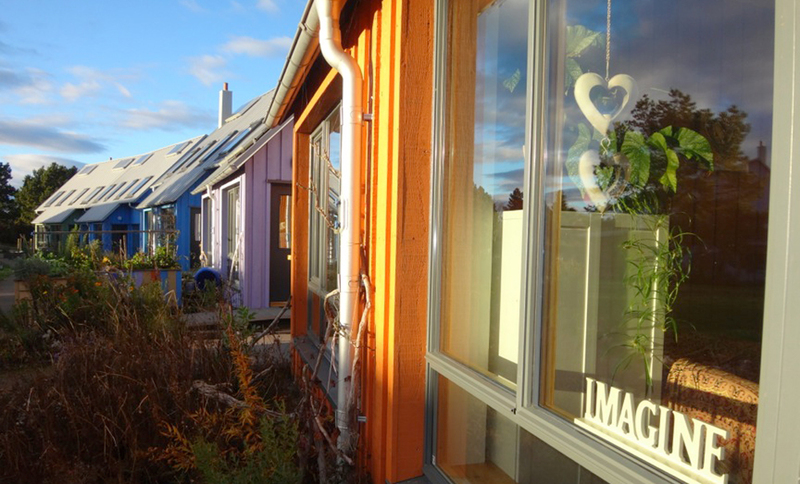 No formal demand assessment was undertaken – Findhorn is the sort of a place that lots of people visit, and it has a strong following from those keen to explore eco-solutions and alternative ways of living. Many people expressed an interest in the opportunity presented by the acquisition of the land, and there were numerous meetings to discuss what might be possible. Those that invested in the purchase of the land were also offered first refusal on any plots that might be developed. A core group came together under the Duneland banner to develop a brief for the cohousing development. About half the homes were ‘reserved’ for some of the original shareholders, and the remaining properties were effectively built speculatively by Duneland. With hindsight the team behind the project feel this wasn’t the best solution, as many of the eventual occupiers had little say in the design of the development or the layout of their individual homes. Once the project was underway further purchasers emerged and they acquired the remaining properties. The mix of occupiers is not as diverse as the team originally expected – there are quite a number of single retirees. Purchasers were not allowed to buy to rent, and they could not be purchased and then rented out as a holiday home. Nonetheless one consortium of 13 households did buy one of the units and they share it (as an informal timeshare). The homes were sold for between £160,000 (two bed flats) and £238,000 (three bedroom terraced houses). This cost also helped to cover the communal facilities that are provided which include a shared laundry, a common room, workshop, bike store and the gardens. Duneland managed to fund the whole project without any formal bank borrowings. 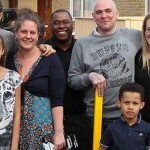 It achieved this because some of those involved had significant personal financial resources, and they were wiling to informally lend between the members of the group to secure the cash to pay the building contractor and others. The goodwill and trust that develops in a cohousing initiative makes this possible – and its something that regularly happens. So, in practice, several of the occupiers paid all the cost of their homes up front, or put down very large deposits. And some of the shareholders in Duneland also provided informal loans. This informal financial structure also raided the money to pay for the four affordable homes, that are now rented out at social rent levels. The local planning authority was broadly supportive of the development as it recognises Findhorn is an important tourist attraction that generates a lot of business/economic activity for this remote part of Scotland. The area identified for housing was brownfield land and lay within the local settlement boundary. The only unusual feature was that the Duneland team opted to provide one and a half parking spaces per home (rather than the local standard of two), arguing that its existing car sharing scheme meant that fewer spaces would be required. Zoning plan showing areas reserved for residential development, woodland and marshes Some of the homes were designed to have an adjoining workspace, to facilitate home working. In reality almost all of these have been incorporated into the adjoining homes – to provide an additional bedroom or general living accommodation. The occupiers all own the freehold title of their individual homes. A residents association has been formed that manages the shared spaces, and takes responsibility for the surrounding landscaped areas. The majority are occupiers have had a long association with, and understand the ethos that surrounds Findhorn. But some of the purchasers of the speculatively built properties had less of an understanding of the set-up. 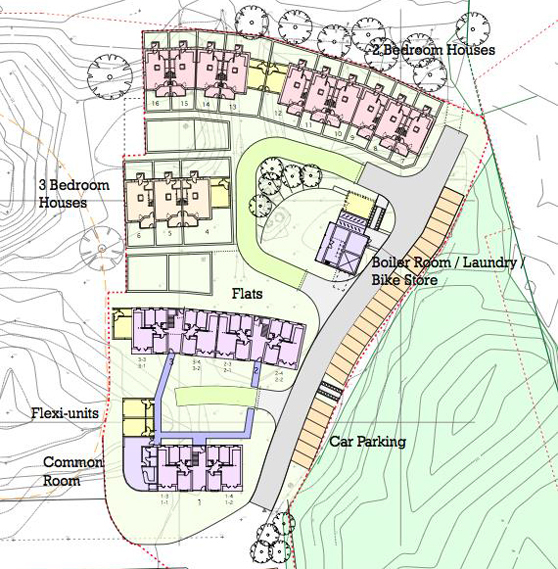 Consequently some of the ‘late arrivals’ wanted to make changes to the layouts and adjust the specifications of their homes (even though they were already on site) and this caused some challenges. 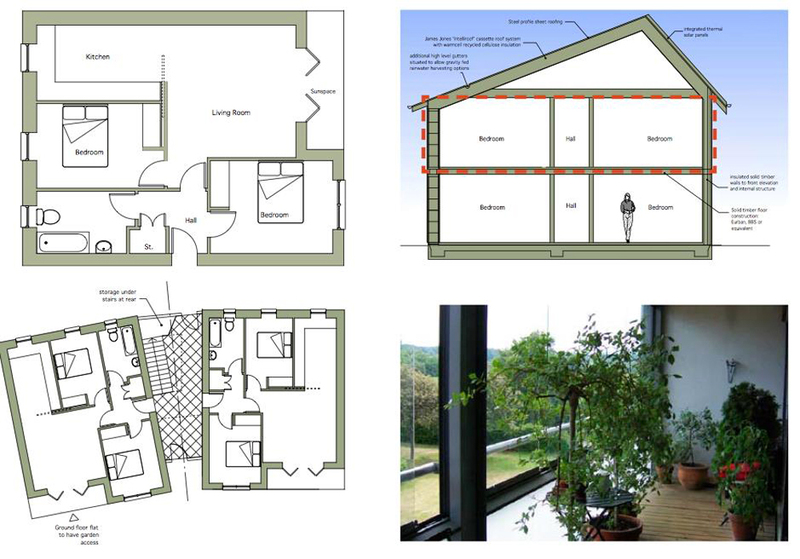 Air source heat pumps and MVHR systems are difficult for many people to understand and operate effectively This plan shows the current proposals with six detached plots (one of which is highlighted) next to six other plots that will be procured as a terrace (see later in this case study), and four further plots in ‘Phase 2B’ in the top left corner of the plan The location of the self-build plots with early servicing already installed By the summer of 2015 three of the six initial building plots had been sold. 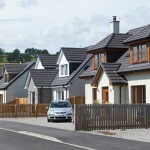 The plots range from 120 sq m to 400sq m, but most are around a 300 sq m and are capable of accommodating a two-storey home of between 150 and 200 sq m. Plots are being advertised at between £55,000 and £105,000. 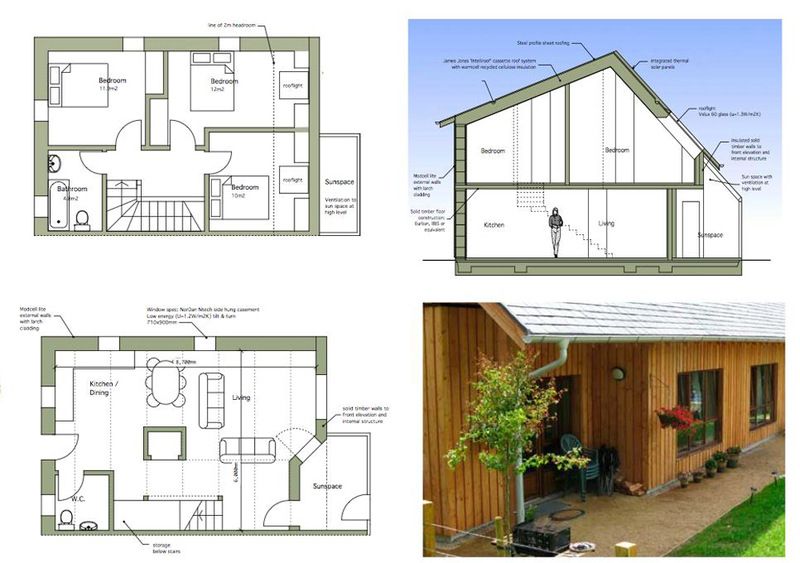 There are some design restrictions on the homes to ensure they tie in with the look of the other homes in the area. These include a height limit and a maximum footprint size for each plot. Natural materials are encouraged along with renewable energy systems, and the properties have to meet minimum energy standards. 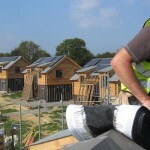 Purchasers are also given a four years to build the homes (with penalties for non-completion). If sold at a later date two per cent of the sale value is donated to a fund to provide further affordable housing in the area. 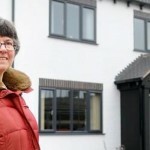 Some design restrictions have been imposed – for example there is a limit on eaves heights, and the self builders are asked to design their homes to tie in with the look of the other nearby properties. 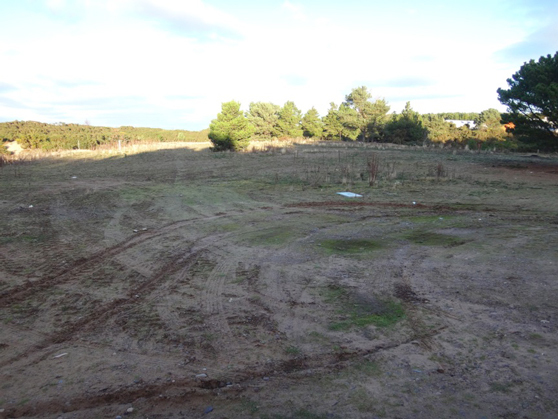 The Duneland team also has the right to see (and approve) the designs before construction, and, as part of the process, there is also an opportunity for the wider Findhorn community to comment on the design. The local authority itself has not developed a Design Code, and will just treat every planning application in the normal way. There are also plots identified for a conference space or pub/restaurant, and three areas set aside for workshops or other community businesses. 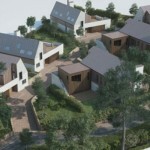 These homes are planned as part of the self-build plots area, and are arranged as a sweeping terrace that joins up with the individual plots. The six homes are a mixture of two and three bedroom properties, with the two central ones being a storey height taller. They are generally arranged with bedrooms on the lower levels and the main living space covering the whole of the first floor. 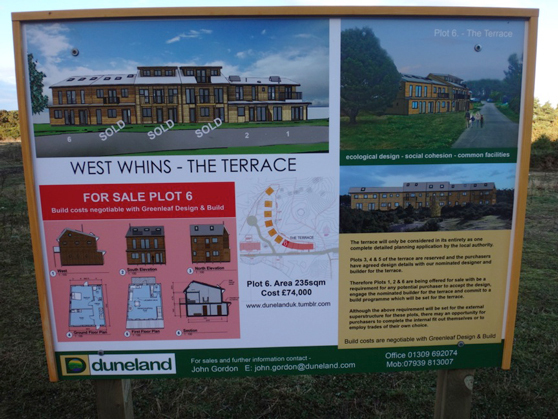 By building six homes in a terrace (in one contract) cost savings of about 20 per cent are possible – compared to building six detached properties Site board advertising the project. 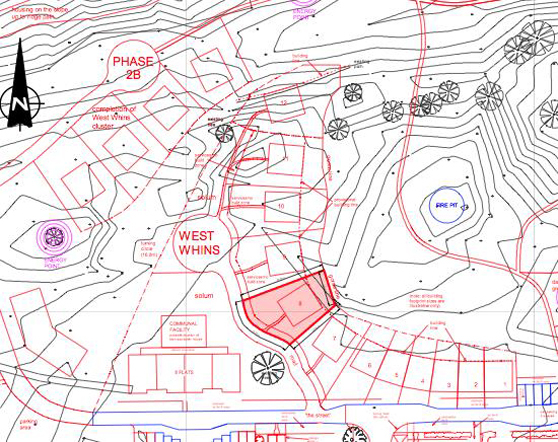 The plan in the centre identifies the location of the terrace, which is marked in red Ground floor plans –the homes have the main living space at first floor A local contractor (Green Leaf Design & Build) is planning to build all the homes in one go. By the early summer of 2015 five had been pre-sold, and construction was expected to begin in a matter of weeks. They should be finished early in 2016. 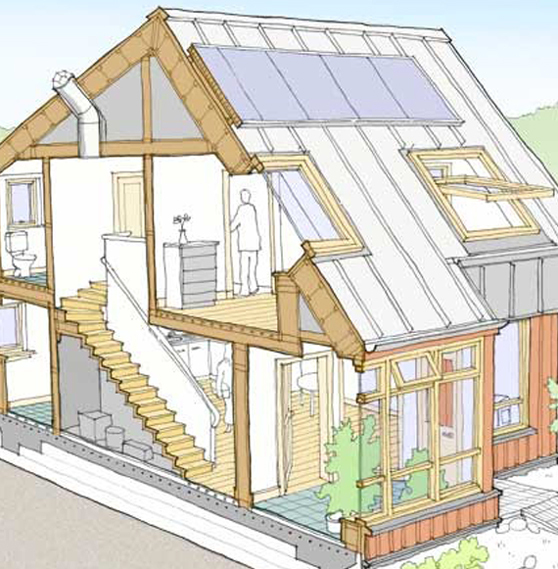 The homes employ a simple timber frame and are going to be built to a reasonable specification. A plastic coated steel roofing system is proposed, with solar thermal panels and a solid fuel boiler (or ASHP). The owners can be provided with a ‘shell’ finish that they can then complete themselves, or the contractor can do everything for them. 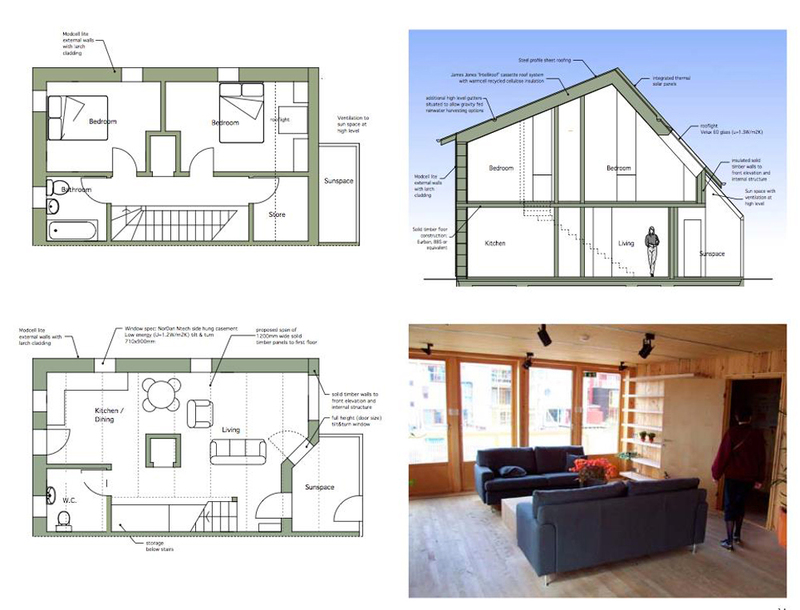 Architect’s drawings of the terraced homes – a typical two bed home is being marketed at £74,000 In addition to this cost purchasers also have to contribute to the planning application costs, structural and SAP fee, building warranty and tender documentation costs – a total of around £3,500 per home. 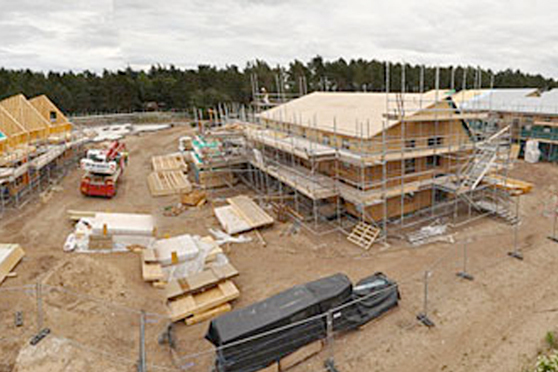 Purchasers will be asked to pay in six stages – when foundations go in, at first fix of the timber frame, when the homes are wind and watertight, when the external finishes are complete, when the internal work is finished and at final completion. There are also early plans for a block of eight smaller apartments nearby (five of which will be affordable). But more fund raising will be required before this can progress, so it is unlikely to be on site before 2017.